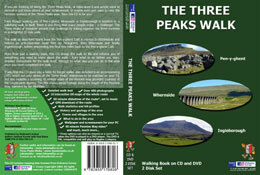 If you are thinking of doing the Three Peaks Walk, or have done it and simply want to reminisce and show others of your achievement, or maybe even just want to view the fantastic scenery of the Three Peaks area, then this CD and DVD set is for you. Even though walking any of Pen-y-ghent, Whernside or Ingleborough in isolation is a satisfying walk in itself, there is a one thing that many people enjoy - a challenge! The Three Peaks of Yorkshire provide that challenge by linking together the three summits in a delightful 25-mile walk. The walk as described starts from the Pen-y-ghent Café in Horton-In-Ribblesdale and follows an anti-clockwise route first up Pen-y-ghent, then Whernside and finally Ingleborough, before descending the final few miles back down to the Pen-y-ghent Café. More than just a walking book, this CD brings the walk to life and informs you of everything you need to know about the walk - from what to do before you start, detailed instructions for the walk itself, through to what else you can do in the area once you have completed the walk. The CD itself includes: Detailed walk text; over 400 photographs; 16 interactive OS maps of the whole route; 50-minute slideshow of the route; GPS download of the route; walk statistics and hill profiles; history and geology of the area; towns and villages in the area; what to do in the area; wallpaper and screensavers for your PC and much, much more. If you find this CD gives you a taste for longer walks, also included is an accompanying DVD, which not only allows all the Three Peaks slideshows to be viewed on your TV, but also includes a stunning 45 minute video of the Pennine Way provided courtesy of the Countryside Agency. The film shows aerial footage along the length of the Pennine Way, narrated by Ian McMillan. A SAVING OF £15 on RRP!